A recent study regarding hydraulic fracturing suggests an awful lot of people simply don’t know a lot about it and most fractivists would like to keep it that way, trusting the mystery of it all to create doubt. A majority of Americans have heard little or nothing about hydraulic fracturing. Many Americans do not know if they support/oppose it or are undecided. Those who have made a decision are evenly split between support and opposition. Predictors of support include education, media use and top of mind associations. The data on which these findings is based is from a survey conducted in September, 2012. Some recent polls suggest the more people know about about hydraulic fracturing, the more they approve of it, especially as the benefits continue to spread. Nonetheless, the need for continued education is clear, if for no other reason than to correct the mis-information coming from well-funded special interests opposed to development of any kind. They cannot be allowed to use the supposed mystery of hydraulic fracturing to cast doubt on what is a safe, simple and sustainable technology. 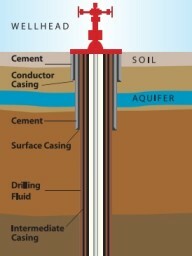 Energy In Depth’s “Just the Facts” page is a concise but through explanation of hydraulic fracturing in lay language. It answers many of the most common questions and disposes of the principal myths surrounding the process. Everything is sourced, with links to numerous documents, videos and other sources of information; including EPA, the Ground Water Protection Council and numerous state regulatory agencies. Every serious issue connected with hydraulic fracturing is addressed and the page is constantly updated. 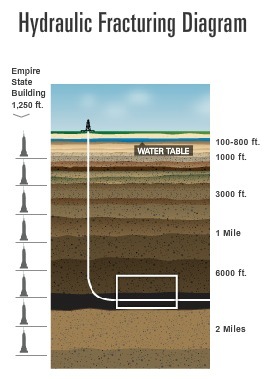 Hydraulic Fracturing 101: What Every Representative, Environmentalist, Regulator, Reporter, University Researcher, Neighbor and Engineer Should Know About Estimating Frac Risk and Improving Frac Performance in Unconventional Gas and Oil Wells. 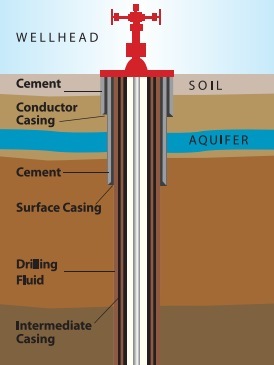 This 80 page academic report is published on the FracFocus website and provides a detailed comprehensive explanation of the hydraulic fracturing process used for both shale oil and gas wells today. It is addresses, in a very honest and forthright fashion, not only what’s involved with hydraulic fracturing, but also related processes. The material is laid out to answer all the key questions but isn’t necessarily designed for popular consumption or easy reading. It is, nonetheless, a superb reference and addresses how risk assessment should play into decision-making, although it often gets ignored. 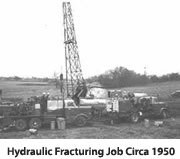 The FracFocus site includes much more as well, including its own explanations of the process, its disclosure registry and a history of the process (see circa 1950 photo of hydraulic fracturing job to right). This is an easy to follow and understand website that includes a history of hydraulic fracturing, an Interactive Fracturing 101 slideshow and links to other pages and site regarding disclosure, new green fluids and much more. This is a great place to start to learn what HF is all about. The slide show takes the viewer through the entire development process, using a combination of simple graphics and pop-up explanations. 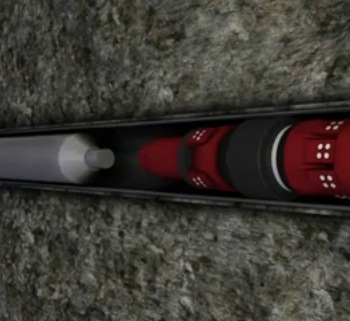 It allows viewers to understand how HF is separate and distinct from drilling and completion, yet related and integral to extracting the gas. The American Petroleum Institute (API) also maintains a hydraulic fracturing page that includes access to numerous publications, standards, explanatory materials and descriptions of industry best management practices. It also addresses some of the issues that have arisen from false start studies (e.g., the flawed EPA investigation of the Pavillion, Wyoming case – later dropped due to numerous problems with the way it was handled). There’s virtually no questions on hydraulic fracturing that cannot be answered using the API site as a resource. So, there is no lack of educational information, only a need to get it out there! Just added it, Bill! Thanks! These are all great teaching and learning tools for sure! But a lot of people like a hands on real person to show them the process from start of the pad to finished well. Like i said before this site is a fantastic source for real facts and information but a lot of land owners would like a Hartford Pa. type of demonstration through and across NY. For sure a lot of those attending were there for the free picnic but they all left with a better understanding of the industry. Sure it would be a bit pricey but so are all the lease and production funds being lost. It would make it a lot harder for the oh-no,s to spread their misinformation! Kinda take the devil out of the whole line of of bull they have been spreading! How about it Cabot? We really need this ! Maybe the most of the County fair grounds will help? The problem I have with this whole process is two fold. First off with the Cheney Bush energy bill of 2005, operators do not have to disclose their ingredients in this process. It has become a way to dispose of dangerous chemicals instead of properly disposing of it under the supervision of several laws like the clean water clean air acts, etc. Secondly the cement and metal tubes that encase the wells will eventually decay and since over 80 percent of the waste remains in the wells, it will eventually move into the aqua-fern. By that time, all the carpet-baggers (energy explorations companies) will have moved on to other areas leaving the tax payers the trillions of dollars needed to clean up your mess. Anyone who thinks this is the way to go is sadly an opportunist that is trading their morals in for cash. Like the money changers in the temple, Jesus will have he say one day but I have to assume these oil/gas companies pay homage to the almighty dollar instead of the Almighty. The comment by Bob Zanakis makes a judgment based on his own lack of knowledge about the process. First of all, for everyone who believes in the “Halliburton Loophole” manipulation all the anti-fracking political activists use, please read the very thorough debunking provided on the Natural Gas Now site, which you can find by clicking on the “Hydraulic Fracturing” link in the header. “Halliburton Loophole” is the invention of people who want to manipulate you into believing some sort of “vast right-wing conspiracy” against the environment exists. It is fear-mongering and manipulation, but I encourage you to read all sides of that issue and make up your own mind. Second, Bob invents the claim that companies who provide hydraulic fracturing services are using it “to dispose of dangerous chemicals.” He ignores the existence of fracfocus.org, where companies report the chemical composition of their fluids and which is required in Pennsylvania. He also ignores the fact that you can’t just use ANY chemical for hydraulic fracturing: You must use specific chemicals for specific reasons. Bob’s real goal is to increase your fear factor by hinting at the existence of some conspiracy to pollute the environment. Third, Bob talks about casing failures being inevitable, but he does so out of ignorance of casing construction and monitoring. Each layer of each cement job is pressure tested to ensure its integrity. Companies routinely evaluate casing to ensure its ongoing integrity. They have both a regulatory and economic stimulus to perform this work. Casing failures are violations that can result in fines and other punitive measures. Economically, the more gas companies keep in the pipeline, the more money they make and the more royalties they pay to mineral owners. The idea that onshore casings are failing at a dramatic rate was constructed by Cornell University political activist Tony Ingraffea, who unethically used a decade old off-shore drilling chart to draw conclusions about modern on-shore casing construction (http://energyindepth.org/national/60-percent-of-statistics-are-made-up/). Lastly, Bob invokes the name of Jesus to pass his own judgment on those who support American energy development. This is the final “nail” in Bob’s campaign of fear, that your eternal soul is jeopardized by fracking. Bob, do you even know Jesus? Or do you just know how he would respond to natural resource development issues? I would follow Bob Zanakis anywhere before I would follow you out of a burning building ! Have no idea what you’re talking about. Also, your IP address suggests you’re from nowhere near Dimock, more like Sweet Valley in Luzerne County. Come on, fess up, Mountain Man! Who are you? Why are you hiding? Even famous anti fracking Dr. Tony Ingraffea debunks the “Halliburton loophole”.